Jointly with RC13 Democratization in Comparative Perspective, RC28 Comparative Federalism and Multilevel Governance, RC44 Security, Conflict and Democratization, RC50 Politics of Language. This conference will bring together a number of IPSA research committees to examine the challenges building democratic state institutions, how legacies of the past inform the present and what impact this has for the future of democratic governance in ethnically diverse societies. The conference will provide an opportunity to examine the role of local, national, regional, and international actors in the development of democracy, the accommodation of ethnic diversity, and the design of political institutions. We welcome contributions that focus on democratization and institutional design as open-ended processes driven by internal and/or external factors, including ethnicity, gender, class, religion, neoliberal economic development, and geopolitics. Papers that focus on the social, economic and legal legacies of the past and how they affect the future direction of politics in diverse settings are particularly welcome. 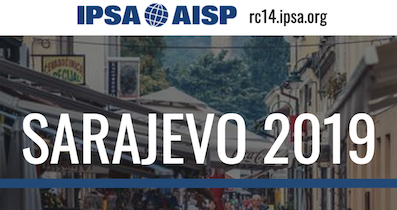 Given that the conference will be convened in Sarajevo, Bosnia and Herzegovina, two decades after the violent civil war that followed the break-up of Federal Yugoslavia, we particularly welcome proposals that reflect upon the Ottoman, Austro-Hungarian, and Yugoslav legacies of the past, the international peace-building efforts of the present, and the democratic reforms for the future of Bosnia and Herzegovina. We also welcome proposals that develop case studies or compare issues of peace-building, institutional design, and/or ethnic accommodation evident in other parts of the world. · What role do structures of government, particular federal, power-sharing, power-dividing, and other forms of integration and accommodation, play today in confronting the diverse set of legacies of the past in individual countries, regions and/or globally? · How do the changing cleavages of ethnic and cultural identities challenge perceptions of linear history and practices of governance in contemporary states? · What are the benchmarks for democratic governance in diverse societies and how can such societies avoid processes of democratic retrenchment, particularly post-conflict? · What impact does the global rise of populism have on political relations in ethnically diverse and democratizing states? What are the long-term effects of international intervention for liberal peacebuilding after violent conflicts, ethnic or otherwise? · What is the impact of the legacies of inter-communal conflict on the prospects of political stability in postconflict democratizing states? We invite proposals for individual paper contributions and/or panels that engage empirically, conceptually and normatively with these issues. We aim to feature the best of contemporary research on democratic transitions and institutional design, including new research by established academics as well as by early career scholars. The confirmed keynote speaker is Professor Kanchan Chandra, New York University. Proposals for papers should include contact details of the author(s), title and an abstract of no more than 200 words. All participants will be required to register for the conference. IPSA has implemented a new category of membership for citizens from low and lower-middle income countries; the list of eligible countries can be found here: https://www.ipsa.org/membership/individual/global_south_category. Please self-identify at the time of registration. After 1 May 2019, the student rate will be raised by 20 € and by 40 € for the remaining categories. The cost of the conference dinner is 35 € and should be paid at the time of registration. The organizers will endeavor to provide a select pool of graduate students/early career academics with a bursary to partially cover travel expenses to Sarajevo. Please identify your eligibility and if you wish to be considered for the bursary at the time of your submission. The decision on the pool of recipients will be made in May 2019.